This is core CG repertoire, partly because of early championship by artists like Segovia, Abel Carlevaro and Julian Bream, but also because the music is so accessible, with elements of popular and erudite music intertwined. In the end, though, it’s because this music is so damn good. He’s picked three Villa-Lobos pieces with great character, and more importantly he plays each of them in a character-ful way. And he puts them in the penultimate spot, as they deserve, with just a sad, beautiful little piece by Mompou as a coda. This seems an excellent way to introduce more Villa-Lobos into such a crowded marketplace. That CD, by the way, ended up on my Top 10 Albums list for 2015. 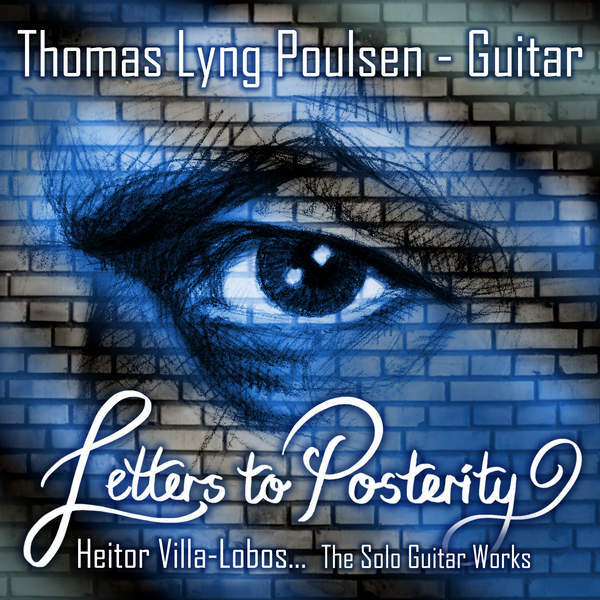 Now we come to Thomas Lyng Poulsen’s Letters to Posterity, which includes pretty much the full solo music for guitar on two CDs. This includes music of a very broad range, from salon pieces and dances Villa remembered from his days playing in chorões bands, to the more-than-pedological Etudes of the late 1920s, and on to the great Preludes of the 1940s. I wouldn’t expect a single guitarist to excel in all three areas, but Poulsen provides credible versions of pretty much all of the music. His technique is strong, and the music is clearly communicated. He’s strongest, I think, in the Preludes, which are all five really excellent. This is maybe a bit of a surprise considering Poulsen’s teaching experience; I would have expected the Etudes to be the sweet spot for a guitar teacher. Choros no. 1 didn’t quite swing the way I like it to (I prefer the Brazilians Fabio Zanon, Manuel Barrueco and Turibio Santos), and parts of the Suite Populaire Bresilienne seemed over-thought, over-serious. A word that has filled my thoughts this past week is rubato. Another one is pulse. It appears to me, that the balancing of these two mighty musical weapons is the key, to succesfully solving the pieces I have worked on so far, on this blog. Finding that balance means – I believe – searching territory bordering absurdity. Absurdly rigid and on-time, and absurdly fluid to the point of incomprehensible. When you’ve been there, I guess it’s all a matter of relaxing, and just playing… But as always, easier said, than done. This is music which takes an interesting route between simplicity and complexity. When the issues are technical – and even Segovia had his troubles with Villa’s music – solving the technical issues won’t ‘solve’ the music by itself. When the music seems simple an artist can bring out subtleties that aren’t immediately apparent, but were clearly put there by the composer. Leonard B. Meyer called this Grammatical Simplicity and Relational Richness, in a key paper about (of course) Mozart. I value Thomas’s journey as much as his destination; both demonstrate a significant subset of the Relational Richness of the music of Villa-Lobos.